You spoke, we listened. Changes are coming to the Swim Lessons program based on participant feedback. A common concern we heard was that the ratio of students to instructors was too high for beginners. 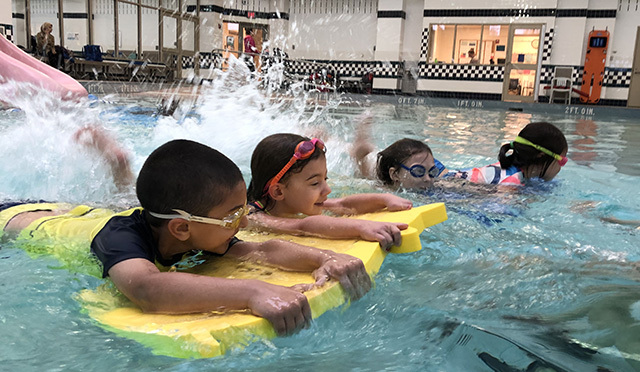 New ratios for 2019 are four students to one instructor for Preschool lessons, and six to one for Learn to Swim Levels 1-2. Fees have been updated to support these changes. Additionally we’re introducing new equipment, and a new assessment form to determine the best starting point for you or your child. Simply fill out the form below to get started. Registration for all aquatic lessons is first come, first served using direct online registration, or in person registration at the DCRC on the dates listed. Payment is required at time of registration. We strongly suggest that you print a receipt when you register online. Direct online registration offers participants’ fast and convenient registration results. Registering for an alternative class if you can’t get into your first choice is encouraged, as space and numbers of instructors are limited. Keep your brochure close by when enrolling on-line. You will need a class schedule as found online or the brochure, so you have the correct program number. Incorrect household information may cause registration difficulties. Should you experience errors due to incorrect ages of your child or other household information, call 614-410-4550 to update your household information, then try again. To check the status of your enrollment, follow the instructions on the online registration information page. Payment is due upon registration. You must use a Visa, MasterCard or Discover when registering online. If you prefer to use cash or check you must come to the DCRC to register. Please confirm the amount at the front desk. If you cannot attend your class you will receive a refund, minus a $15 administration fee, if requested before the deadline for that term. All other refund requests require a physician’s note and approval from the Aquatics Supervisor. To be placed on the wait list you must call 614-410-4550 or come to the DCRC and pay to be placed on the list. All efforts are made to get you into a class. Refunds are processed three weeks after the term begins to those who can not be accommodated. Please check the dates on the swim lesson schedule to determine if you are eligible for a refund. After the refund deadline you will only receive a refund with a doctor’s note that states your child cannot attend classes due to physical reasons. All refunds are charged a $15 administrative fee. Those who are on the waitlist will not be charged the $15 administrative fee. In order to provide the best learning environment we suggest that family members observe swim lessons from the observation deck located off the upper level track. This allows for less distraction for students and provides a more comfortable environment for spectators. If you find your child continually trying to interact with you during their class, we encourage you to move out of the immediate area so that their attention remains focused on their instructor. No make-up classes are offered for lessons missed by participants If for some reason we must cancel a class, every effort is made to offer a makeup. DCRC facilities will maintain normal operating hours unless directed otherwise by the City Manager. All DCRC class/activity schedules will coincide with Dublin City Schools. Whenever schools are released early, all evening classes at the DCRC are cancelled. When school is cancelled, all daytime DCRC classes are cancelled, and a decision regarding evening classes (those after 5 p.m.) will be made by 3 p.m. Please call the Information Hotline at 614-410-4946, to find out about evening classes. All attempts will be made to make up missed classes, but there may not be enough time to do so. If you are having a difficult time figuring out which level is right for your child you may bring your child in for a free swim assessment to see which level they should be registered for. The free swim assessments will take place on Wednesdays between 4-7 pm. Stop at the Front Desk and ask to see Matt. If you have any additional questions about swim lessons please contact Matt Rice at 614.410.4597 or mrice@dublin.oh.us. (Children under 3 years old) Parents are in the water with the children. All children not toilet trained must wear a waterproof diaper (available at the Front Desk). Parents are in the water with the children. All children not toilet trained must wear a waterproof diaper (available at the front desk). This class allows parents and little ones to have a peaceful and relaxing first experience with the pool. Singing, games and some basic skills are taught, designed to help you and your child learn to love the pool. This class helps the child trust the parent in the water. The instructor teaches the child to respect the water and enjoy the experience with the parent through drills, games and songs. The child will be going under the water within the first few weeks. This class helps the child trust the parent in the water. The instructor teaches the child to respect the water and enjoy the experience with the parent through drills, games and songs. The child will be going under the water within the first few weeks, and will learn to be comfortable in the water. They will also learn to swim a short distance after jumping into the water, and be comfortable lying on their back with little support. Parents start the session with their child in the water and then move out of the water slowly, away from their child until the instructor is teaching the children without the parents being present. Children are in the water with an instructor (no parents). Step from side into chest-deep water, push off the bottom, move into a treading or floating position for at least 15 seconds, swim on front and/or back for 5 body lengths, then exit the water. Move into a back float for 15 seconds, roll to front, then recover to a vertical position. Push off and swim using combined arm and leg actions on front for 5 body lengths, roll to back, float for 15 seconds, roll to the front, then continue swimming for 5 body lengths. Enter water by jumping from the side (into deep water), fully submerge, then recover to the surface and return to the side. Jump into deep water from the side, recover to the surface, maintain position by treading or floating for 1 minute, rotate one full turn then turn as necessary to orient to the exit point, level off, swim front crawl and/or elementary backstroke for 25 yards, then exit the water. Push off in a streamlined position then swim front crawl for 15 yards, change position and direction as necessary, swim elementary backstroke for 15 yards, then exit the water. Perform a feet first entry into deep water, swim front crawl for 25 yards, change direction and position as necessary and swim elementary backstroke for 25 yards. Swim breaststroke for 15 yards, change direction and position as necessary and swim back crawl for 15 yards. Submerge and swim a distance of 3 to 5 body lengths underwater without hyperventilating, return to the surface, then exit the water. Perform a shallow-angle dive into water at least 9 feet deep, swim front crawl for 50 yards, then swim elementary backstroke 50 yards using appropriate and efficient turning styles throughout. Swim breaststroke for 25 yards, change direction of travel as necessary and then swim back crawl for 25 yards using appropriate and efficient turning styles throughout. For adults who are new to the water. The goal is to overcome fear of the water and teach basic swimming techniques. Skills taught include water adjustment, floating on the back and stomach, flutter kicking on your stomach and back, arm action for the front crawl and the elementary backstroke. Participants coordinate the front crawl and backstroke. New strokes include elementary backstroke, sidestroke and breaststroke. The goal is to incorporate stroke development, build endurance and adjust to being in deep water.